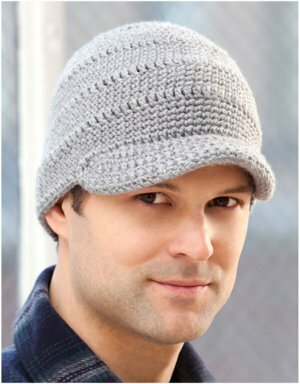 Next time you're wondering what to get the man in your life, consider this Brim Hat for Him from Red Heart Yarn. Beanie caps for men are easy projects when you're just learning to crochet, and he'll love that you put in the time to make him something! GAUGE: 16 sc = 4”; 15 rows = 4”. CHECK YOUR GAUGE. Use any size hook to obtain the gauge. NOTE: Hat is worked in continuous rounds. Place marker for beginning of round. Ch 4, slip st in first ch to form ring. Place marker for beginning of round. Round 1: Work 6 sc in ring – 6 sts. Round 2: Work 2 sc in each st around – 12 sts. Round 3: [2 sc in next st, sc in next st] – 18 sts. Round 4: [2 sc in next st, sc in next 2 sts] – 24 sts. Round 5: [2 sc in next st, sc in next 3 sts] – 30 sts. Round 6: [2 sc in next st, sc in next 4 sts] – 36 sts. Round 7: [2 sc in next st, sc in next 5 sts] – 42 sts. Round 8: [2 sc in next st, sc in next 6 sts] – 48 sts. Round 9: Ch 3 (counts as dc here and throughout), dc in same space, dc in next 7 sts, [2 dc in next st, dc in next 7 sts] – 54 sts. Round 10: [2 sc in next st, sc in next 8 sts] – 60 sts. Round 11: [2 sc in next st, sc in next 9 sts] – 66 sts. Round 12: [2 sc in next st, sc in next 10 sts] – 72 sts. Round 13: [2 sc in next st, sc in next 11 sts] – 78 sts. Round 14: Ch 3, dc in each st around. Rounds 15-18: Sc in each st around. Rounds 19-28: Repeat Rounds 14-18. Round 29: Hdc in each st around, slip st in first st.
Mark 22 sts on front of Hat on Round 29 for Brim. Row 1: With right side facing, join yarn in first marked st, working in front loops only, sc in each next 22 sts. Row 2: Ch 1, turn, sc in each st across, sc in back loops in next 4 sts on Hat – 26 sts. Row 3: Ch 1, turn, sc in each st across, sc in front loops in next 4 sts on Hat – 30 sts. Row 4: Ch 1, turn, sc in each st across, sc in back loop in next st on Hat – 31 sts. Row 5: Ch 1, turn, sc in each st across, sc in front loop in next st on Hat – 32 sts. Row 6: Ch 1, turn, sc in each st across, sc in back loop in next st on Hat – 33 sts. Row 7: Ch 1, turn, sc in each st across, sc in front loop in next st on Hat – 34 sts. Row 1: With wrong side facing, join yarn on wrong side of Row 1 of Brim, sc in back loops of first 22 sts. Row 2: Ch 1, turn, sc in each st across, sc in front loops in next 4 sts on Hat – 26 sts. Row 3: Ch 1, turn, sc in each st across, sc in back loops in next 4 sts on Hat – 30 sts. Row 4: Ch 1, turn, sc in each st across, sc in front loop in next st on Hat – 31 sts. Row 5: Ch 1, turn, sc in each st across, sc in back loop in next st on Hat – 32 sts. Row 6: Ch 1, turn, sc in each st across, sc in front loop in next st on Hat – 33 sts. Row 7: Ch 1, turn, sc in each st across, sc in back loop in next st on Hat – 34 sts. Using Brim as a template, cut a piece of stiff interfacing or plastic to same dimensions. Slip piece in between layers of Brim and sew Brim closed. I am having a problem with the Brim? Where or how do I increase stitches? Video??? Made this hat today and it sooooo didn't have any shape. I got to the end of the pattern and it never did get any real definition to it. I'm thinking that maybe stop the increase at row 10 or 11... I would also quit somewhere around row 23/25 as it was entirely too long. If this was a Red Heart Pattern... then I am not surprised, I have real troubles with most of their patterns on a regular basis. Where is the shaping for the hat? I am on #17 and have a huge flat circle. When I try to form it into hat shape, it is too full. Should there have been some decreases? its very good but is there any video for it??? ?